Your situation and your financial objectives are unique and there is no substitute for sitting down with you to find out what your financial and personal goals are. Next, we assess what your current arrangements will achieve and determine what is needed to meet your financial and personal goals. This may include analysing assets, liabilities and cash flow, current insurance coverage, investments or tax strategies. As independent and impartial financial planners we are able to conduct research from the whole of the market without being influenced by product providers ensuring our recommendations are solely based on exactly what is right for you to meet your goals. After we have exhaustively researched the most appropriate products we develop recommendations that address your goals in the form of an advisory report. We present you with the recommendations and go over them with you to help you understand them so that you are able to make an informed decision. We attentively listen to any of your concerns and may revise the recommendations as appropriate. We then agree on how the recommendations will be carried out and liaise with the various product suppliers and put everything in place for you. 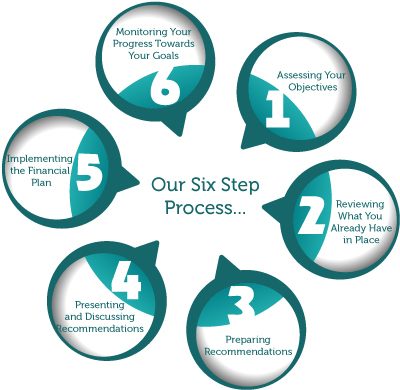 We will always report to you periodically typically annually or half-yearly to review your situation and monitor the progress towards your goals. We ensure you remain on track to meet your objectives. We are constantly monitoring the financial environment and if any changes occur we’ll spot it and recommend the adjustments you need to stay on track.